My favorite thing about fall – other than all things pumpkin flavored – are the stunning colors of the leaves in the trees. I love the contrast of reds and oranges against a blue fall sky, but my favorite fall color is bright yellow. Those yellow leaves seem like the last connection we have to the warmth of summer. They’re also the color of my favorite flower – the always cheerful sunflower. Which bring us to today’s cake. It’s a gorgeous three-tier cake and it’s all yellow! There are several things I loved about this cake, beginning with the icing. The yellow icing was actually painted on to mimic brush strokes on a painting. And look at those stunning sunflowers – they were created with oven-dried meringue and take this cake over the top in elegance and beauty. 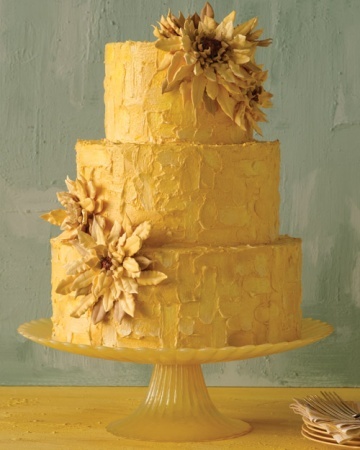 This lovely sunflower cake would be perfect for a fall wedding, especially if your wedding colors included browns, oranges, or reds. This cake would make quite a statement and would brighten the room. Plus, it’s not often that you see an all yellow wedding cake, so why not be a bit daring and be unconventional? I found this sunny cake here.